Ayelet Shaked, the current minister of ”Justice” wants to weaken the Supreme Court and make it subservient to the whims of the political parties and puts ads on Facebook that are meant to be funny about fascism. Her colleague, Naftali Bennett, who is the current minister of “Education” and co-chairperson of the new political party Hayamin Hehadash (“The New Right”) wants to launch a major war in Gaza, apparently no matter what the cost and no matter where this leaves us at the end of such a disastrous war–as does Avigdor Lieberman, chairman of the Yisrael Beiteinu (“Israel is our Home”) right wing party and former Minister of Defense. Moshe Feiglin, who is leader of the new Zehut (“Identity”) far right party, wants to rebuild the Third Temple and have Jewish Law replace the laws of the current Israeli parliament, at the same time that he wants to make recreational marijuana free and available to everyone. In addition, Bezalel Smotrich, leader of another far-right “religious” nationalist party called Habayit Hayehudi (“The Jewish Home”) is a settler from the West Bank who is famous for making outlandish racist remarks against Arabs in Israel and Palestinians in the West Bank. And Itamar Ben Gvir, the current leader of the most extreme and most racist political party in Israel, Otzmah Yehudit (“Jewish Power”), who is an avowed fanatical “Kahanist”, is the scariest of them all, but since he is a lawyer, he uses clever language so that he is now acceptable to Bibi and the Likud party, most of whose members are also far-right in their political ideology although they hide it a bit better than their more outright racist political partners. Does this sound unbelievable? Does it sound like the Israel that was established by its founders 70 years ago? And, where is this leading us? If Netanyahu and the Likud get more seats in the Knesset than Kachol Lavan (“Blue and White”), the new “centrist” party led by Benny Gantz and Yair Lapid, then all these ultra-nationalist right-wing parties will form a right-wing government — as they promise us every day on the news and via their elections propaganda — in cooperation with the Ultra-Orthodox political parties (Shas—Sephardic Torah Judaism and Agudat Yisrael — United Torah Judaism ), thus creating the most ultra-nationalist and ultra-orthodox government in the history of the state of Israel. The ultra-orthodox parties represent medieval obscurantist versions of Judaism, which huge portions of the Jewish population abhor, but that does not stop the Likud “leaders” from making coalitions with them. This is the scary and dangerous reality that we face as we approach elections in Israel in a few days. It is the result of societal trends which have been going on in Israel for many years by now, but it is nevertheless particularly disturbing at this time in our history. We are witness to Israeli politics as its worst, with the danger of the diminishment of democracy in this country very real, and the forecast of an Israel polity becoming more and more autocratic and reactionary. Apparently there is a good chance, according to most current polls, that Blue and White will win more seats in the parliament than the Likud, but will they be able to form a coalition without being blackmailed by the ultra-orthodox political parties? Not likely. And unfortunately — for reasons that are completely out-of-date in the 71st year of the state of Israel, not to mention anti-democratic, they will not form a coalition with the Arab political parties, which in recent years have had 12 seats in the parliament, even though they represent loyal citizens of Israel who make up 21% of our population. Anyone who forms a coalition with Arab parties would be branded as “leftists” (i.e. “traitors” in the minds of the Likud and right-wing political parties) even though they insist that they are “centrists”. 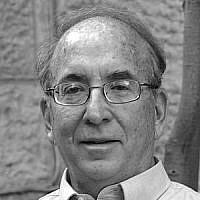 For all these reasons, liberal Jews and humanist Zionists, like myself, are very worried, and beset by extreme anxiety in the here and now, parallel to the feelings of our friends and colleagues in the USA, who are living through the nightmare of the Trump presidency, which is not only dangerous for America, but is also actively trying to influence the elections in favor of the right-wing parties in Israel, who are his “base” in Israel, and especially in the West Bank. It seems that Netanyahu and Trump have a symbiotic relationship that is reaping havoc with democratic institutions in both countries. One can only hope that somehow enough voters in Israel will rise above petty politics, resist the Likud’s persistent and pernicious propaganda, and come to their senses to oust Bibi and his cohorts from the government on April 9th. This will be critical for the sake of a better future for all of us here in Israel, Jews and Arabs alike, and for the improvement of the moral standing of Israel in the world. I would go so far as to say that ridding the country of this corrupt and contemptible government is the moral imperative facing the people of Israel at this particular point in our history.